April 16 found us docked at Banjul, capital of The Gambia. But before we get to that we have to tell you about something that happened 3 days earlier when we crossed the Equator for the fourth and last time. During his daily afternoon announcements the day before the Captain told us about a ship that was sailing in the Pacific on the eve of the first New Year of the 20th century. It seems that it was near the international date line at the time, so its captain decided to alter course a little so that midnight would find them straddling the spot where the Equator crosses the date line. At that moment half the ship was in Winter (above the equator) and half in Summer (below the equator). Half the ship was in the last day of December (on one side of the date line) and half the ship was in the first of January. But the really unique thing was that half the ship was in the 19th century and the other half in the 20th century. Anyway, the Captain mentioned that we would be crossing the Prime Meridian as well as the Equator, but not at quite the same time. So he was later presented with a petition from some passengers requesting that he alter course so we could cross the point where these two lines intersect and he agreed to do so. It would be around 11:00 at night so the cruise director scheduled a “pajama party” in the Crow’s Nest to celebrate. In the end many were disappointed because the ship missed the mark by about 20 feet. But since the Amsterdam is more than 100 feet wide it seemed to us that if its GPS said it was within 20 feet then part of the ship must have passed over the spot. We have no evidence for this, but we prefer to believe that the cabin where we were asleep at the time passed smack over the intersection of the Equator and the Prime Meridian! Of course, this intersection was nothing like that of the 19th century ship detailed above. Amsterdam was half in Winter and half in Summer, but that is true any time you cross any part of the Equator. The special thing about this particular intersection is that it is the only place on Earth that is zero degrees latitude and zero degrees longitude. So, as the Captain said, navigationally speaking this spot is the center of the world! 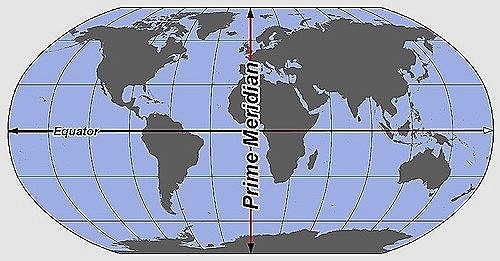 This is pretty arbitrary, though, since the Prime Meridian is just a line on a map drawn in the late 19th century to pass through the observatory in Greenwich, England. In any event, the only thing to see there (even when it isn’t night out) is water. As you can imagine, then, there are no pictures. Getting back to The Gambia, it is a tiny country that includes only the land on both sides of the Gambia river. Except for its seacoast Gambia is bordered entirely by Senegal, which surrounds it. Gambia became a British possession under the Versailles Treaty of 1783 and achieved independence in 1965. “The” was added to its name to avoid confusion with the sound-alike country of Zambia. Gambia’s first president held office for almost 30 years, then a military coup installed Yahya Jammeh as president. He held onto office for 22 years and was voted out in a surprise electoral upset in December, 2016 . A few days later he rejected the electoral result and vowed to hold onto power but a military incursion by several African nations finally forced him out in late January, 2017. So when we arrived Gambia was only 15 months into its first democratic government. Banjul, the capital, is on an island at the mouth of the River Gambia and has a population of only about 35,000. Its name derives from a Mandinka word for bamboo, which grew plentifully here a few hundred years ago. After the British abolished slavery they built a fort on this island in 1816 to stop the deportation of slaves from the area, with mixed success. From where we were docked we had an expansive view of the port. It took longer than expected to clear the ship for disembarkation so we had some time to watch the ferry traffic in the port. People of a certain age will remember LaVar Burton’s breakthrough role as Kunta Kinte in the 1970’s TV series Roots, based on Alex Haley’s book of the same name recounting the slave history of his family. In the series and in real life Haley’s presumed ancestor Kunta Kinteh was captured and sold into slavery in Gambia. Today there is a nearby island named for him and we saw a ferry named for him as well. A lot of people disembarked from these ferries, probably commuting to work in Banjul. An alternative way to cross the river or travel upriver is by pirogue, long thin boats we saw beyond the ferry dock to our right. At the end of the dock next to the ferry dock was a half sunken ship, which had apparently been there awhile since they had arranged floating lines around it. We were scheduled for a bus excursion through the area in the afternoon so we caught the ship’s shuttle to the Albert Market in the center of town. It isn’t too far to walk but we were told that the area in between might not be safe. The Gambians have a reputation (well deserved in our small experience) for friendliness – Gambia is nicknamed the “Smiling Coast” – but we decided to play it safe in this unfamiliar territory and, in fact, some of the streets looked a little uncertain. They dropped us off in an alley at the back entrance to the market. The craft market had kiosk after kiosk of wood carvings, masks, baskets and other interesting items. Nothing had a price on it; everything was about haggling. Many people enjoy that but we aren’t among them. You couldn’t just ask for a price either. The response was always “How much would you offer?” The vendors were aggressive in asking you to come in and look at their wares but they were always friendly and never curt or demanding. We bought a few things and learned some lessons about shopping in this environment. After lunch we boarded the bus for our excursion. First stop was the National Museum, a small but interesting facility. No photography was permitted inside, which housed a large collection of vintage photographs and a room full of interesting musical instruments among other things. Outside were a number of bronze sculptures, one of which we understand is a likeness of former president Jammeh holding a baby that once stood at Arch 22, which we would see later. We drove on to Bakau, crossing what we understand to be the River Gambia. On the way we passed the National Assembly building, a mosque and wetlands with mangroves and many birds. We passed what we took to be the Bakau Craft Market on the way to the nearby Kachikally Crocodile Pool. This has been a pilgrimage site for several hundred years and women still come here to douse themselves with water from the pool as a fertility aid. You walk through a bit of forest to reach the crocodile pool. The most noteworthy item along this walk is a tall Beobab tree, although we also saw a crocodile that had somehow gotten himself far into a covered water trench. Apparently the crocodiles are permitted to run free as they like & are sometimes found in neighboring yards and on porches. Kachikally is, obviously, a tourist attraction as well as a sacred site. Many of the crocodiles are said to be quite docile and well used to humans, but we don’t think we would test that. On the other hand, there is (or was) a well known crocodile here named Charlie, 70+ years old and 9 yards (feet?) long, who allows visitors to touch his back without a problem. We have read, though, that a number of different crocodiles play this role and all are referred to as Charlie. Be that as it may, there was a crocodile in a spot near the pool with a line of visitors waiting to pet him on the back. Mary took a pass, but Rick got in line & touched the crocodile. He was so still that we were unsure whether he was alive or dead until Mary saw him blink his eyes. I wouldn’t try this at home (or in Australia)! Leaving Kachikally, we drove through Bakau’s somewhat desolate back streets to visit a school, which had a small library across the road. We also passed a vendor selling batik pictures, looking quite pretty as they blew in the wind. We stopped for a local Julbrew beer in the courtyard of a guesthouse called “Smiling Coast.” Musicians were setting up for their show later in the evening. The beer was very good. We drove to Serekunda, Gambia’s largest city with a population of 350,000, where we visited a batik and tie-dying workshop. Some workers were applying wax to a cloth in preparation for dying a batik picture. We drove back to Banjul, passing a mosque and driving under Arch 22. The arch commemorates the coup of July 22, 1994, that put former president Jammeh into power for 22 years. Before Jammeh was ousted we couldn’t have driven under this arch because only the president himself was permitted to do that. A monument of an “unknown soldier” (that some think resembles Jammeh) used to sit in a traffic circle in front of the arch, but we think we saw it at the National Museum earlier today (shown above). The arch is more than 100 feet tall, one of the tallest buildings in Banjul, and is remarkably ugly, consisting of a triangular building on top of two groups of pillars. Some folks got out of the bus to photograph it but it was so ugly and was built to celebrate oppression, so we just waited on the bus. We did see it from the ship, however. Our last stop was the Albert Market. The bus stopped in front of the market while the guide and about half the passengers went inside for a quick walk-through. We had been there this morning, of course, and it had been a long day so we elected to wait on the bus. Many of the Gambian women dress in very bright, colorful clothes. You have seen a few already, but a number walked by the bus in front of the market, some carrying items on their heads. Back at the port a large impromptu market was set up along the dock in front of the ship. A group of women there were performing some lively song and dance. We sailed away from Banjul as the sun was setting, with some boats still out in the water, and headed north for the short trip to neighboring Senegal.